Richard invites us to understand one of the deeper fruits of meditative self-awareness: Being present in our bodies, living the immediacy of each moment free from being manipulated by unconscious levels of self-identity. As the author of a book that was used to influence millions of voters in the 2016 U.S. Presidential Election through social media disinformation campaigns (without his knowledge), Sean Webb probably knows the human mind as well as anyone can. From his work in logically modeling human emotions for the world of Artificial Emotional Intelligence, to his real-world practice as an author, speaker, and guide to helping individuals supercharge their minds and lives with the knowledge of how their mind works, Sean pushes the bleeding edge of mind sciences to the next level. The interesting part; Sean credits his knowledge to a conscious awakening he had 20 years ago which unfolded how the mind, the universe, and consciousness works both within and outside the human body. And science is proving him right. Over the last 20 years, Sean has become one of the world’s leading experts in how the human mind works, particularly in the area of human emotions, the driving force and motivation of all human actions globally. His work is used by universities and engineering firms to teach emotional intelligence, the foundations of artificial emotional intelligence and his discoveries have proved so effective, that his work is currently being turned into programs to address addiction management and the mitigation of PTSD after early amazing successes within those applications. As an alumnus of Georgia Tech’s Advanced Technologies Development Center, Sean has spent years solving complex systems problems for cutting edge technology and supercomputing companies. His latest complex system solve is associated with the mind; how to model mind processes, how to manipulate mind output, and how to use those disciplines to our collective human advantage. His heart lies in this last portion of the project; teaching individuals about our minds so as to understand the thought processes that steal our happiness and block our ability to enjoy life. He loves sharing the practical neuroscience of how to hack the mind to generate happiness from within without any strings attached, and without changing any of life’s external conditions. He has indeed discovered a new door into the deep mind manipulation, where only practiced meditation and psychedelics have been able to take us before. “And the simple fact is that I pulled it all out of the void,” Sean tells us. Sean has spoken at Science of Consciousness, Science and Nonduality, UNC, UGA, ASU, Emory, Georgia Tech, for numerous multinational corporations, and at NASA. Check out Sean’s work at MindHackingHappiness.com. Sean and his wife are licensed foster parents and are active in numerous children’s and animal charities. Only when you can live with the feeling forever suffering suddenly disappears. Have you tried completely surrendering to suffering? Why are we so afraid of doing it? Comment below. A talk by Rupert Spira. Animated by the “Human Being: User’s Manual”. How does one achieve such state? What tools do we use for the self-inquiry of this kind? Is it enough to sop suffering? Comment below. The truly awakened state is a state of wholeness. Within wholeness, you are no longer referencing polarized ways of viewing experience, such as form and formlessness—you are simply experiencing everything as one seamless whole. Adyashanti explores how in the truly awakened state, wholeness informs your experience of being. Eckhart Tolle Talks – Life Will Become Better If You Start Changing From Now. Watch a five minute video of Rupert Spira’s introduction to the perennial non-dual understanding. In this conversation we discuss how to determine that the Neti-Neti process is complete and then explore the next step. Advances in science and public health are increasing longevity and enhancing the quality of life for people around the world. In this series of interviews with the Milken Institute Center for the Future of Aging, 14 visionaries are revealing exciting trends and insights regarding healthy longevity, sharing their vision for a better future. The Longevity Innovators interviews highlight new discoveries in biomedical and psychosocial science, as well as strategies to promote prevention and wellness for older adults. 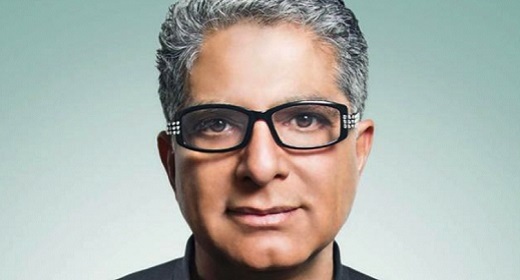 Deepak Chopra, founder of The Chopra Foundation and co-founder of Jiyo ( a “well-being service provider” app) and The Chopra Center, is a world-renowned pioneer in integrative medicine and personal transformation. Time magazine has described him as “one of the top 100 heroes and icons of the century.” In an interview with the Milken Institute Center for the Future of Aging, Chopra spoke about his lifestyle choices for well-being and healthy aging and how people can use their brains to achieve health and happiness. Milken Institute Center for the Future of Aging: Why did you decide to launch the Jiyo app? What is the mission and your vision for its impact? Deepak Chopra: I launched Jiyo to create a global community for total well-being. I refer to Jiyo.com as the “internet of well-being,” a platform for people all over the world to get knowledge from experts in multiple areas: physical, emotional, professional, social, financial, and spiritual. The experts are personally chosen and curated by me, and online courses are offered on everything essential to enhanced well-being and personal evolution — self-awareness, higher consciousness, sleep, stress management, meditation, movement, yoga, breathing exercises, nutrition, love, relationships and grounding. My hope for Jiyo is to help create a critical mass of people engaged in personal and social transformation. Only then can we achieve what everyone desires, a more peaceful, just, sustainable, healthier, and joyful world. How can we strive to find purpose and meaning in our lives? Finding purpose and meaning in our lives demands that each of us reflect on fundamental questions: Who am I? What are the core values of my life? What do I want for myself and the world? And what am I grateful for? If we really investigate and are committed to these questions, life has a way of providing the answers. What lifestyle choices have you made for your well-being and healthy aging? I sleep 8 hours every night. I practice meditation and yoga daily. I walk 10,000 steps every day. I cultivate healthy emotions like love, compassion, joy, gratitude and equanimity. I make sure my diet has a maximum diversity of plant-based foods. I avoid food that is manufactured, refined, processed and high in fat and sugar. I take a week of silence every year. Lately, as an experiment, I also ground myself to the earth through devices when I am in urban settings and am not in direct contact with nature. In our society, where some people do not get enough sleep, how important is having a restful night to the practice of meditation? A good night’s sleep of eight to nine hours for the average adult is very important for experiencing the full benefit of meditation, beginning with inner stillness and alertness but also physical enhancements like improved self-regulation. If we have not slept properly, meditation generally turns into naptime. Sleep, therefore, comes first. Along with [Next Avenue Influencer in Aging] Rudolph E. Tanzi at Harvard Medical School, we have created a brain entertainment device called Dream Weaver that helps people who have trouble falling asleep by getting them into the brain wave frequency that induces both the dream and deep sleep states. How can people properly use their brains to achieve health and happiness? The human brain has three components — the lower or instinctive brain, the emotional or limbic brain and the cortical or intellectual brain. By practicing meditation and self-inquiry, by cultivating healthy emotions, and by not being impulsive and reactive, we can integrate our three brains — this is conscious evolution. Homo sapiens alone have the capacity to transcend genetic programming, which controls physical evolution. By pursuing evolution in a conscious way, we also enhance our capacity for insights, intuition, imagination, and creativity. Are we missing key information about improving brain health? Brain health was an obscure field 20 years ago, and many findings are still provisional. For example, it is strongly suggested that low-level chronic inflammation and treatable infections in the brain may be vital to preventing and perhaps curing Alzheimer’s disease —only time will tell. What is brain plasticity and what impact does it have on disease prevention? Brain plasticity means that the brain isn’t fixed and static. It has the capacity to increase the number of neurons, known as neurogenesis, and also the connections between neurons, known as synaptogenesis. Rehabilitation from strokes, for example, has been revolutionized since my days in medical school thanks to this new knowledge. But for healthy people, brain plasticity can be enhanced through mental practices. I call these practices metacognition. Metacognition is conscious awareness of experience as it is happening, along with mindful awareness of our choices as we make them. These possibilities are discussed in Super Brain, coauthored by Rudy Tanzi. How would you advise people who are going through difficult times? First, recognize that all experience is impermanent. The only invariant or non-changing factor in every experience is awareness. Cultivating self-awareness through a daily spiritual practice helps us navigate difficult times. But everyone is different, and we have to be realistic. Advising someone suffering from chronic depression to be more self-aware is probably impractical when what’s needed immediately is to improve their symptoms and relieve their mental pain. The real secret to happiness, however, is universal: seek your source in pure consciousness, and you will find that happiness is included in the ground plan of existence. Such an agenda is a tall order, I know, but this has been the ultimate cure for centuries and hasn’t worn out. At A-Fest Montego Bay 2017, Gelong Thubten, the Tibetan Buddhist Monk who trained the movie cast of Dr. Strange, reveals the secret to strengthening your mind and the biggest misconceptions about pain, bliss, and meditation. A-Fest is an invite-only transformational event that gathers an extraordinary community of change-makers and visionaries who are driven by epic ideas to impact the world – entrepreneurs, employees, artists, leaders, innovators, visionaries and more. IN this video, Eckhart Tolle tells how we shouldn’t let any life situation to overpower us! is a spiritual teacher. He is a German-born resident of Canada best known as the author of The Power of Now and A New Earth: Awakening to Your Life’s Purpose. In 2008, The New York Times called Tolle “the most popular spiritual author in the United States”. In 2011, he was listed by Watkins Review as the most spiritually influential person in the world. Tolle is not identified with any particular religion, but he has been influenced by a wide range of spiritual works. The Power of Now and A New Earth sold an estimated three million and five million copies respectively in North America by 2009. In 2008, approximately 35 million people participated in a series of 10 live webinars with Tolle and television talk show host Oprah Winfrey In 2016, Tolle was named in Oprah’s SuperSoul 100 list of visionaries and influential leaders. Oh lovers, where are you going? She lives in your own neighborhood. there blooms a garden in your own home. A man who has been to several retreats feels he is doing something wrong because he is not getting it. We each have an instinct toward greater consciousness, and our spiritual practice is a way of responding to that. Adyashanti explores how the spiritual impulse originates and the importance of bringing our consciousness into the depths of our unconscious. Adyashanti explores the heart of spirituality and invites you to drop this inquiry into your being: What is dictating the orientation of my life? Setting aside judgment and the endlessly dissatisfied ‘me,’ you can dive deeply into the exploration of your highest values, and with clarity, you can orient towards them. IN this video, Sadhguru talks about the importance of opening of Third Eye. Does it really exist? He answers it in this discourse! Jaggi Vasudev, popularly known as Sadhguru, is an Indian yogi, mystic and New York Times bestselling author. He founded the Isha Foundation, a non-profit organization which offers Yoga programs around the world and is involved in social outreach, education and environmental initiatives.